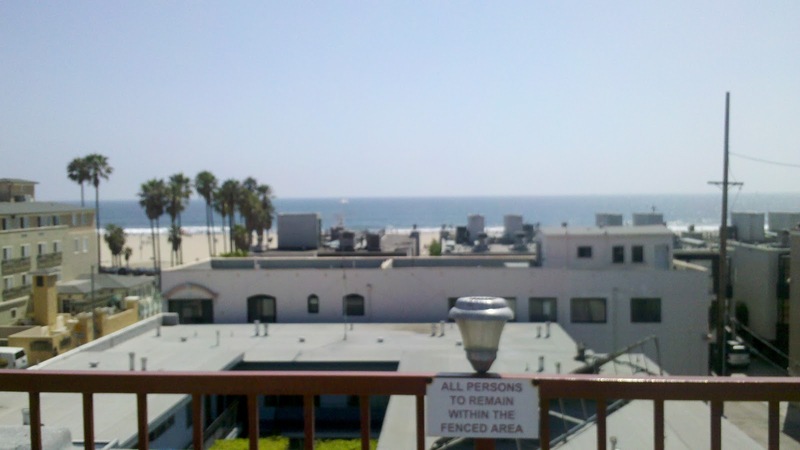 Rooted Practice: Summer Wrap #2: Good Eats in Venice! Believe it or not, I did more than just yoga in Venice. Mostly, I ate thanks to the zillions of yoga calories I was burning. There was a ton of fresh, local, and mostly organic food within walking distance of our apartment. On most days, we ate breakfast at home, went to a class or two, came back and ate lunch on the roof before heading back to the studio for and afternoon and/or evening class. Our view from the roof deck--which was loaded with lots of comfy lounge chairs, a table, and a grill. 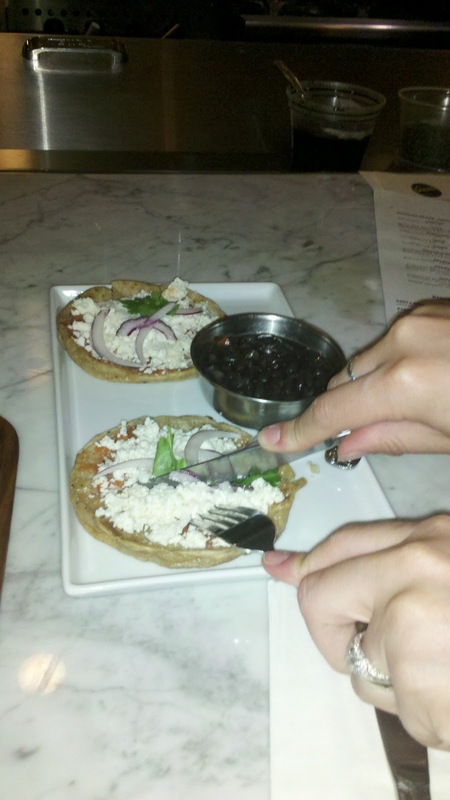 We asked around and got so many recommendations for fabulous restaurants, we ate dinner out almost every night. Sauce on Hampton was recommended to us by Kyra, one of the Exhale yoga teachers (and by a few other people as well.) The restaurant was small, but the food was delicious, seasonal, and organic fare; K really enjoyed the sides. I'm not a sweet potato fan, but apparently the roasted sweet potatoes are very simply prepared but absolutely delicious. They also had a great selection of whole leaf teas. It's definitely worth checking out if you're in the area. We ate several meals at Firehouse--which was especially great for breakfast at any time of the day! I didn't eat at the "other side" of the restaurant, but they serve dinner and also sushi. The breakfast side has a nice outdoor patio where you can enjoy your meal in the beautiful Venice weather. If you're into the "Muscle Beach" scene, they also have a special section of their menu dedicated to bodybuilders, which involved a lot of egg whites, spinach, and plain chicken. 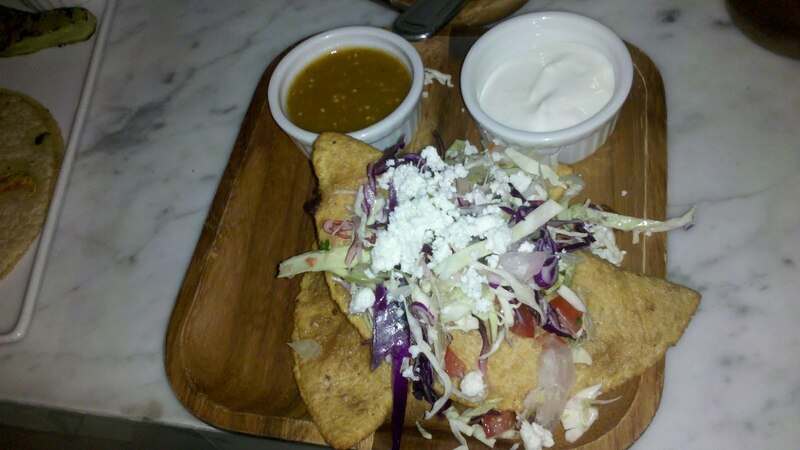 La Fiesta Brava was recommended to us by a local at a coffee house--but we all thought the food was just okay. Not worth going out of your way for. You may also want to note that they don't serve alcohol, but you can BYOB. Normally I'm a sucker for anything with squash blossoms, but these were rather disappointing. Fresh and citrusy--really well-prepared and delicious! Fresh ingredients make this simple dish something special! 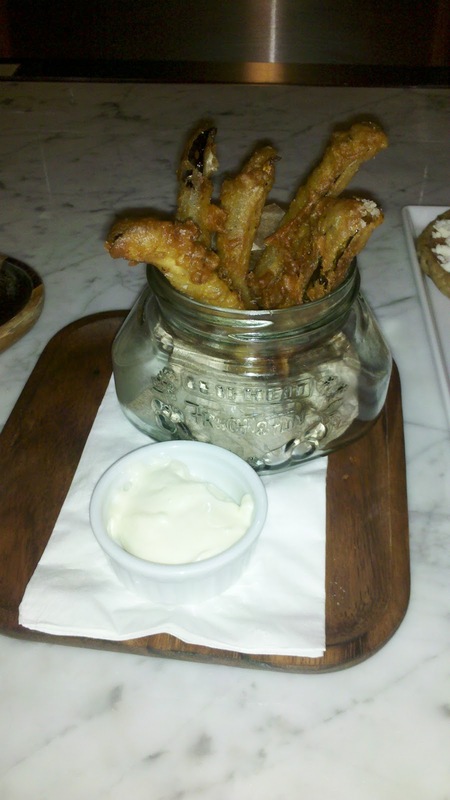 Who can resist fried pickles with garlic aioli? 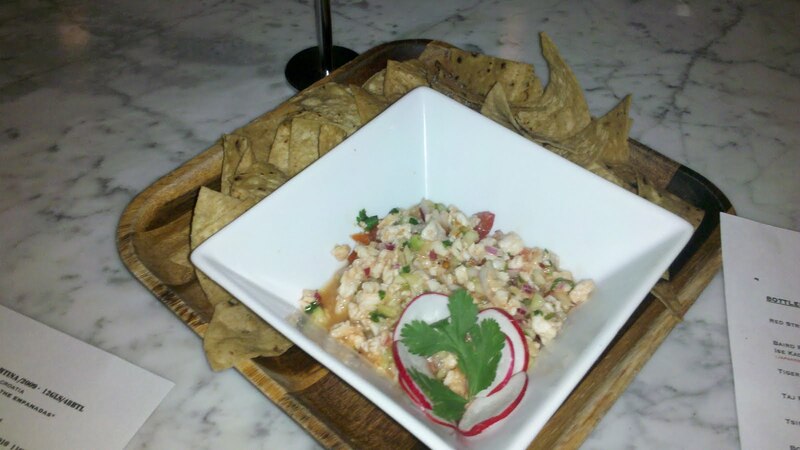 We enjoyed great salads, sandwiches, and fun cocktails at the Venice Ale House. The food was great, although the service was a little slow. We sat outside and were thrilled that they had heaters to keep us warm as the temperature dropped. Sunday was a day of hamburgers for me. 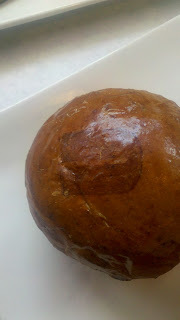 J took a trip to Umami Burger, located inside of Fred Segal, on Saturday. She came back and raved about it--so we had to try on Sunday. The burgers were amazing, but weezer was right about the fries--they weren't anything to write home about. 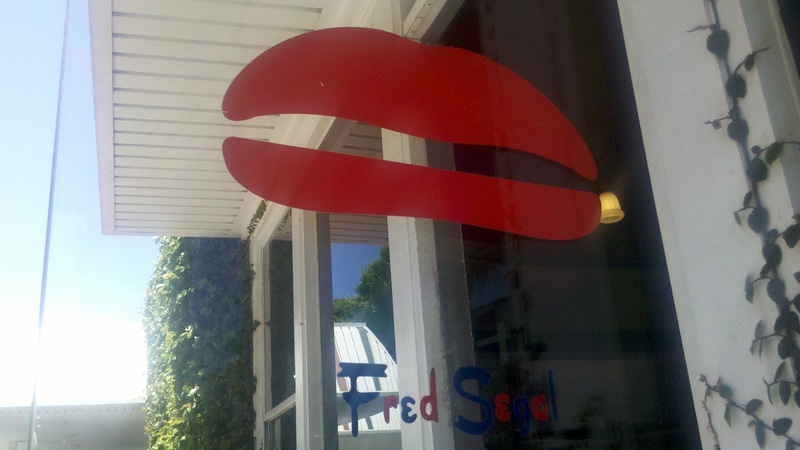 I wasn't a huge fan of the house-made ketchup either--but that's just me. 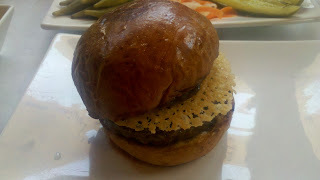 I had the namesake "Umami burger"
Check out the cute little stamp on the top of the bun! I'm a sucker for coffee toffee anything, and this little baby didn't disappoint. Finally, what trip to the West Coast would be complete without a stop at In-N-Out Burger? On Sunday, after taking one last class with Kyra, I packed up my suitcase and called a cab. My driver's name was Eugene and he was WAY nicer than my cabbie on the way in. 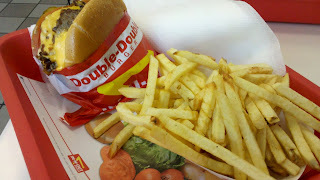 Eugene drove me to the In-N-Out in Culver City on my way to LAX. He even offered to wait for me so I didn't have to call another cab--so I invited him to come inside and have dinner with me. It was nice to have some company for dinner! Double-Double Animal Style, you're my only friend. At this point I'm sure you won't be surprised to learn that, despite taking 22 yoga classes in a week, I came home having GAINED 2 pounds. But I don't care--every bite was worth it. 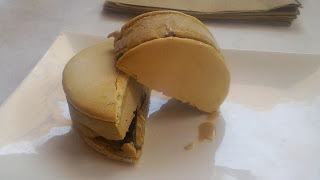 I hope you get a chance to head out to Venice/Santa Monica sometime to taste all of the delicious offerings that I did!